Time goes by way too quickly. 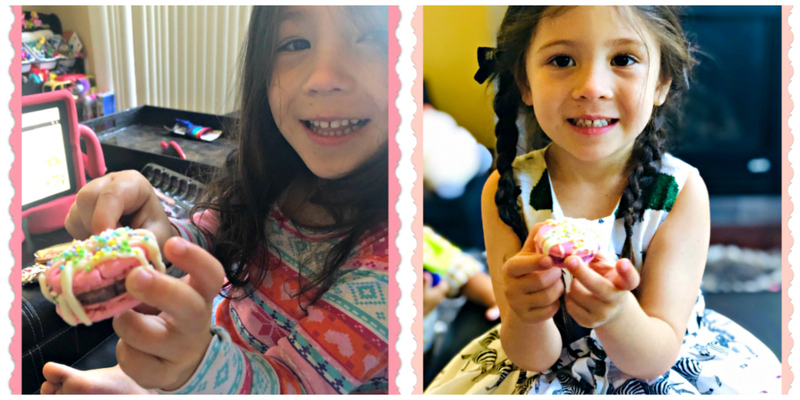 Not too long ago we were thrilled with the idea we would be grandparents, and all of a sudden, that sweet little baby turned four years old! 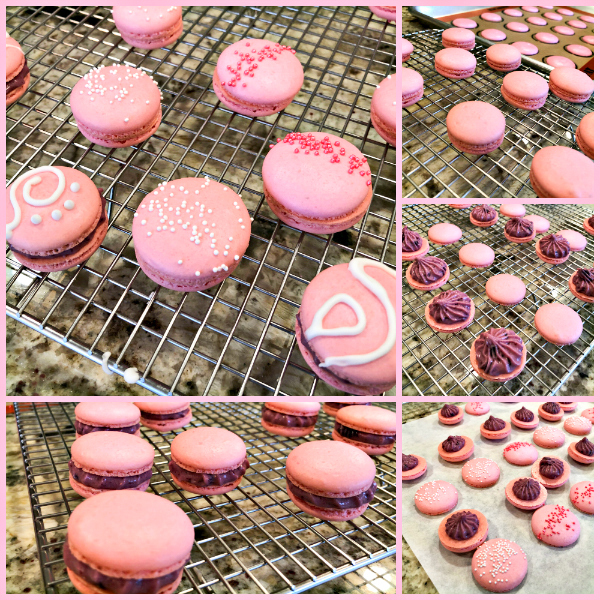 To celebrate the occasion, we wanted to send her a box of pink macarons, as pink is her favorite color. I settled on blackberry filling, and decided to try a bunch of different decorations, so she could choose her favorite. Line 2 or 3 heavy baking sheets with parchment paper or Silpat mats. Layer the powdered sugar and almond meal in a food processor. Pulse until the mixture looks like fine meal, about 15 seconds. Pass through a sieve and transfer to a small bowl. Set aside. Place the egg whites and pinch of cream of tartar in the bowl of a stand mixer fitted with the whisk attachment. Make sure that the bowl and the whisk are impeccably clean. Starting on medium speed, whip the whites with the cream of tartar until they look like light foam. The whites should not appear liquid. The foam will be light and should not have any structure. Slowly rain in the granulated sugar, trying to aim the stream between the whisk and the side of the bowl. Turn the speed up to medium-high. Continue to whip the meringue until it is soft and shiny. It should look like marshmallow creme. Add the gel color and the vanilla. Staying at medium-high speed, whip the egg whites until the mixture begins to dull and the lines of the whisk are visible on the surface of the meringue. Check the peak. It should be firm. Transfer the whites to a medium bowl. Fold in the almond meal mixture in three increments. Paint the mixture halfway up the side of the bowl, using the flat side of a spatula. Scrape the mixture down to the center of the bowl. Repeat two or three times, then check to see if the mixture slides slowly down the side of the bowl. Put the mixture in a piping bag fitted with one of the tips listed above. Pipe on the prepared baking sheets. Slam each sheet hard four to six times on the counter. Then fist bump each end of the sheet’s underside twice. If using sprinkles, add them now, before the shells dry. Let the unbaked macarons dry until they look dull but not overly dry. Drying time depends on humidity. In a dry climate, the macarons can dry in 15 to 20 minutes; in a humid climate, it can take 35 to 40 minutes. While the macarons are drying, heat the oven to 300 F. Bake one sheet at a time on the middle rack. Check in 11 minutes. If the tops slide, then bake for 2 to 3 more minutes. 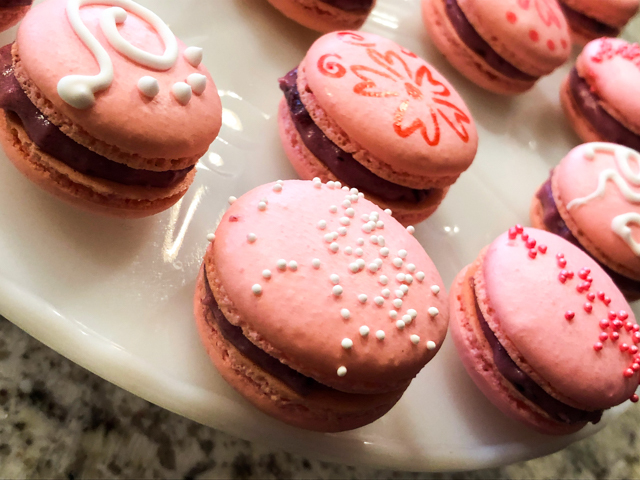 The macarons should release without sticking. Check one or two. If they stick, put them back in the oven for 1 to 2 more minutes. Let the macaroons cool for 10 minutes before removing from the pan. Make the filling: Place chocolate in a heatproof bowl and set over a pot of simmering water on low heat. Stir chocolate until melted. Remove from heat, and whisk in jam and heavy cream. Cover and chill 2 hours, or until cold. Whip it with a hand-held electric mixer until it reaches a good consistency for piping. Transfer ganache to a piping bag fitted with a 1/4-inch star tip. Assemble the macarons: find two macarons similar in size and pipe a good amount of filling to the bottom of one of them. Place the other on top and squeeze gently to take the filling all the way to the edge. Decorate any way you want. Store in the fridge for 24 hours for perfect texture. Comments: The logistics of gifting macarons to someone living a thousand miles away is a bit complicated, but of course doable. Where there is a will, there’s a way, right? 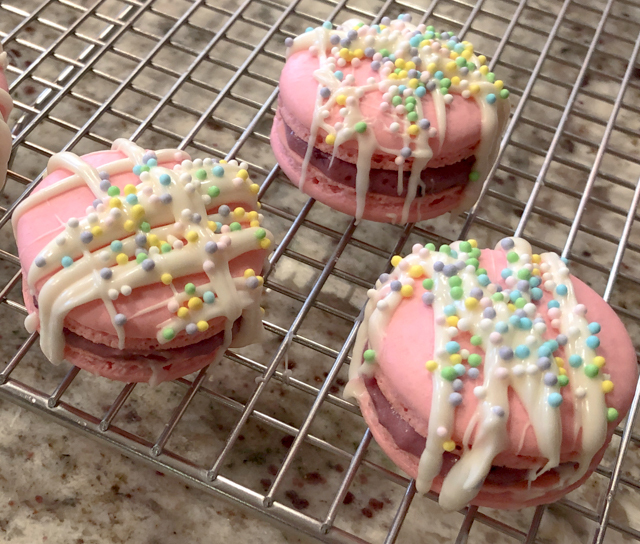 Keeping in mind that macarons need to sit overnight in the fridge to “mature”, you must start the process a couple of days early. The maturation process is essentially absorption of moisture from the filling into the shells. Macaron shells start pretty dry and crumbly, as you’ll notice if you bite into them right after they cool down. Once you add buttercream or ganache, the moisture slowly permeates into the shells and turns the cookie into perfect little morsels of sweetness, with the exact amount of chewiness. But anyway, back to the issue of gifting macs. I used royal icing decoration in some of them, sprinkles in others, went Jackson Pollock in some, and even tried my hands at free drawing with edible markers (first time I dared doing it). 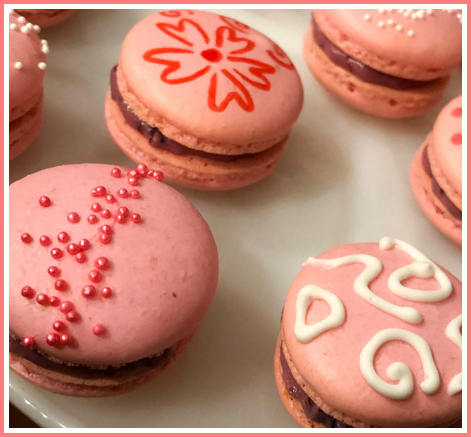 The markers are from Chefmaster and have a very soft tip, you have to still use a light hand on the very delicate macaron shell, but trust me, if I could pull this, anyone can. and her favorite…. DRUM ROLL!!!!!!!!! !